First brewed in 1984, this English-style pale ale is bronze in color with caramel, biscuit malts balanced by an earthy hop bite and juicy, citrus flavors. Jamil Zainasheff provides the groundwork to crafting an authentic styled Kölsch beer. He provides two recipe options, here is the second option. Jamil Zainasheff provides the groundwork to crafting an authentic styled Kölsch beer. He provides two recipe options, here is the first option. Bigger may or may not be better, but it’s a fact that high gravity beers don’t follow all the fermentation rules. Find out how to handle the big numbers. Commercial Kölsch is really only Kölsch if it’s brewed in the German city of Cologne. 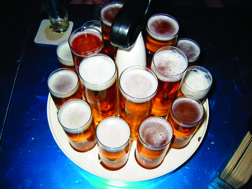 Kölsch brewed at home, however, can be refreshing and crisp on a spring or summer day. Is there any good way to shorten the brew day? The Wiz explores the options. Is the economic news getting you down these days? Are you looking for ways to save money? Find out why putting more beer in your fermenters can mean more cash in your pockets. 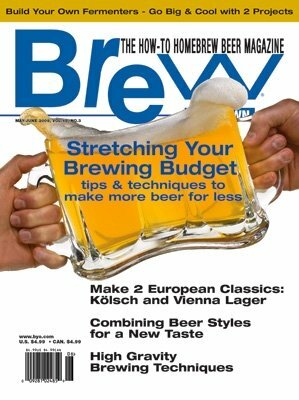 Plus: Money-saving tips from homebrew shops and a homebrew recipe combo for the frugal homebrewer. Do you like brown ales? How about India pale ales (IPAs)? Then why not a brown IPA? Learn how to envision, formulate and brew a “fusion beer” — a beer that is made by combining the elements of two or more existing beer styles. Plus: two example recipes.